ALTHOUGH the conservation area has been board-free since the end of 2012 the odd estate agent still occasionally puts up an illegal board. This board, in Montpelier Terrace, was photographed in February. The MCHA reported it to the council and the board was removed within a week. 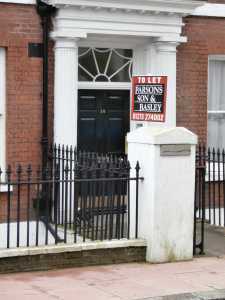 Estate agents’ boards were banned on residential properties in almost all of the city’s central conservation areas in September 2010. However legacy boards–those that had been put up before September 2010 could remain. This created a messy changeover. The MCHA carried out a survey of the area to establish which boards were legal–and which were not. So if you see a new estate agents’ board tell the MCHA–or contact the council’s enforcement officers.